The VM-22HD is a high-performance distribution amplifier for HD-SDI and dual link HD-SDI signals. The unit can be configured as a dual 1:2 distribution amplifier, or as one 1:2 dual-link distribution amplifier. Max. Data Rate - 1.485Gbps. Multi-Standard Operation - SDI (SMPTE 259M and SMPTE 344M), HD−SDI (SMPTE 292M) & dual link (SMPTE 372M). Dual-Mode Operation - Configure as two 1:2 or one dual link 1:2 DA. SDI Dual Link production studios for signal distribution. Broadcast studios for on-air operation. 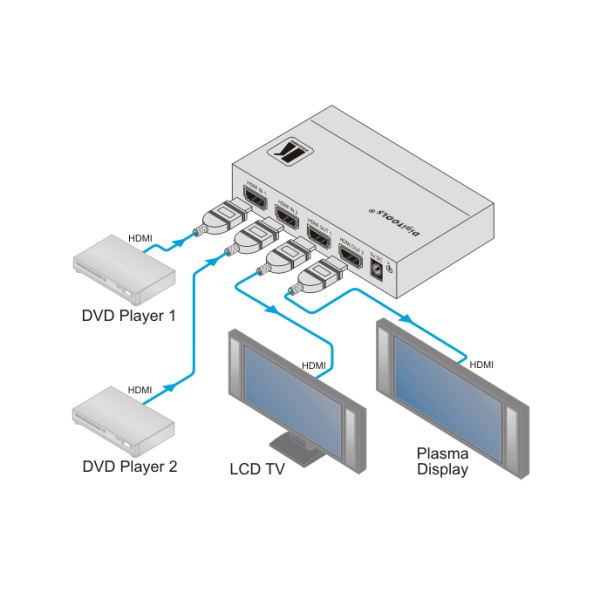 Using with SDI Dual Link video sources such as professional digital players. HD−SDI & SDI Input Indication LEDs. INPUTS: 2 SMPTE−259M, 344M, 292M, 372M serial video, 75Ω on a BNC connector. OUTPUTS: 4 equalized and reclocked SMPTE−259M, 344M, 292M, 372M outputs, 75Ω on BNC connectors. PRODUCT WEIGHT: 0.0kg (0.0lbs) approx. SHIPPING WEIGHT: 0.6kg (1.4lbs) approx.